Summary and Definition: The Flathead Native Indians were not just one tribe. The term Flathead was the nickname given by Europeans to any Native Americans who intentionally changed the shape of their heads to a flat, elongated profile. These tribes included the Coast Salish, the Chinooks, the Clatsop, Kathlamet, Killamuck, Winnapa, Cowlitz, Kwalhioquas and the Wahkiakum tribes. The lifestyle and culture of the different tribes referred to as Flathead Native Indians, had some variations. 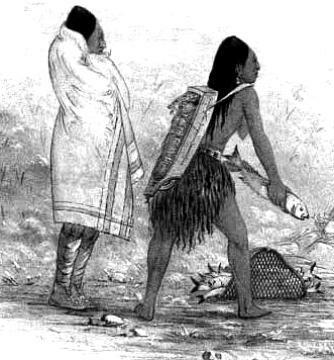 However, the article on the Chinook Tribe provides and overview and description of the clothes, food, shelter and religion of the Flathead people. Where did the Flathead Native Indians live? According to the Journals of Lewis and Clark the Killamuck, Clatsop, Chinnook, and Kathlamet tribes, and all the tribes seen west of the Rocky mountains (the easternmost of the Plateau Indians), adopted a fashion to change their appearance. They changed the shape of their heads. The custom involved flattening the head by artificial pressure during the infancy of all baby boys and girls - hence the name Flathead. What method was used to create a Flat Head? The custom involved flattening the head by artificial pressure during the infancy of all baby boys and girls - hence the name Flathead. The bones of the head in a little baby are soft and can therefore be pressed out of shape without inflicting any pain. As the child grows older, the bones become harder and cannot be easily altered. The Native Indians who followed this custom made the head a wedge-shaped, from a side view. 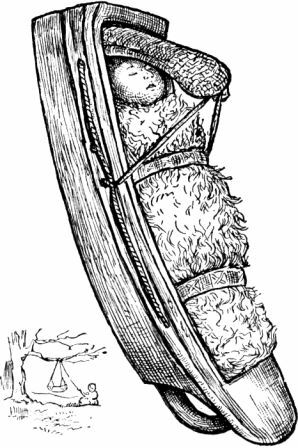 The 'Flathead' look was obtained by wrapping the baby's head in a bandage and using a board, which was hinged to the cradle-board, that was brought down upon the baby's forehead. The process began when the baby was about one month old. The board forced the head to broaden in front and the forehead to slant sharply. After the pressure from the board had been kept on for some months, the shape of the head was changed for life, giving the appearance of a Flathead. The picture shows a Chinook cradle with the flattening board. The heads of the children are released from the bandage between the ages of 10 - 12 months. The procedure resulted in a head with an elongated, flattened appearance, not more than two inches thick from the upper edge of the forehead, and still thinner above. Why did the Flathead Indians adopt the custom? The Flathead Native Indians adopted the custom and tradition of changing their appearance as they believed it made them look more attractive and distinctive from other Native American tribes. The process was painless and did not affect their mental capabilities. It was seen as an act of caring for a new baby and ensuring they were seen as new members of the community in which they lived. It was a sign of status, identification and of prestige. Although the people who made up the groups of Flathead Native Indians were generally peaceful, on the occasions they fought with others it was their practise to take slaves. Flathead slaves were never allowed to adopt the process of changing the appearance of their children. The Flathead Native Indians, both men and women, also adorned their face and bodies with tattoos. The practise was chiefly adopted by the women of the communities. The designs of the tattoos took the shape of circular or parallel lines and dots. Flathead Native Indians History: What happened to the Flathead Native Indians? It is estimated that there are more than 4,000 Flathead descendants. Most lived on the Flathead Reservation (formally the Confederated Salish and Kootenai Tribes of the Flathead Reservation) in western Montana, the fourth largest reservation within the United States of America.